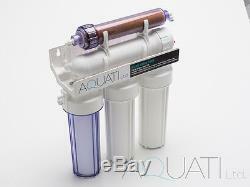 Aquati 5 Stage RO & DI Resin Reverse Osmosis Pure Water Filter for Tropical and Marine Fish /50 75 100 150 GPD/. 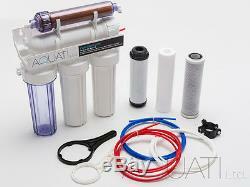 Aquati 5 Stage RO filter is ideal for preparing water for saltwater and freshwater aquariums.. The filtered water is clear, soft and free of contamination. Due to the fact that reverse osmosis is a 100% natural process, the filtration does not involve any chemicals. Designed to provide your fish tank with water of highest quality. The filter kit comes complete with the following: - 5 Stage Reverse Osmosis water filtration system -3x 5 meter lengths of tubing (white, red, blue) - Mains connector: 3/4" BSP to 1/4" adapter - to connect onto your 3/4" BSP hosepipe outlet /garden tap / or 3/4" BSP to 1/4" in-line connector or self piercing valve - Waste water clamp - Water flow restrictor to the osmosis membrane - Dirty water drain clamp - Housing spanner - to open the pods when pre filters need changing - Housing spanner - to open the Reverse Osmosis membrane filter housing when filter need changing Filters' Specifications: Filter 1: 10" polypropylene foam filter cartridge removes sand, rust, silt and other sediments up to 5 Micron Filter 2: 10 activated carbon block filter. The carbon is formed in specially pressured, high density blocks to gain high adsorption rate of chlorine, other chemicals and multiparticle organic substances. Filter 3: 10 activated carbon filter removes 98% to 99% of free chlorine, chlorinated solvents, aromatic hydrocarbons, as well as up to 85% of pesticides of chlorogenic origin, polyaromatic compounds, phenol, benzene and organic substances. Filter 4: Reverse Osmosis high quality membrane (we offer 50, 75, 100 and 150 GPD membranes). The Vontron membrane holds up to 99% of contamination from feed water. It successfully removes harmful organic and non-organic compounds, heavy metals and some bacteria and viruses. The efficiency of the membrane is shown in GPD units (gallons per day) Filter 5: In-line demineralizing filled with high quality DI resin for complete demineralization of water. Openable housing - you can refill the cartridge with media on your own The recommended replacement cartridges /depends on water usage and its condition/: -Pre filters: every 4-6 months -RO membrane: every 2-3 years Add a set of replacements to your order to get it 10% cheaper. 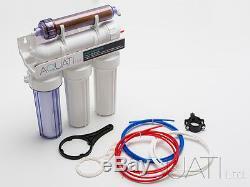 Aquati 5 Stage RO Reverse Osmosis Water Filter is a complete, ready to use device. Quick and easy to install. System's Specifications: -Filtration stages: 5 - Pressure: 2.8-6 bar - Water temperature 2-45°C - pH range: 4-10 - capacity (at optimal conditions) 50GPD- 150GPD - depending on the selected membrane - Filter size: height 40 cm, width 40 cm, depth 15 cm -EU safety standards compliant -Produced for Aquati Ltd. We do not process orders on weekends or bank holidays. Please include your full name, address and order number (if available) inside the parcel so we can easily identify the sender. Aquati Ltd specializes in the assembly and sales of high quality water filtration and purification systems including drinking water filters, whole house filtration systems, aquarium and pond water filters. We also provide replacement filter media, accessories, and professional window cleaning systems. Assembled in the UK Aquati filtration systems are assembled in the UK from reliable components sourced from proven suppliers. We aim to provide high quality products at great value prices. 24 months standard guarantee on filtration systems Aquati filtration systems come with a 24 months guarantee against manufacturing faults as a standard. Extended guarantee is also available (additional charges apply). We pride ourselves on our high standards of customer service and our consistently high feedback is a proof that we succeed. The item "5 Stage RO & DI resin reverse osmosis water filter system 50/75/100/150GPD" is in sale since Wednesday, October 26, 2016. This item is in the category "Pet Supplies\Fish & Aquarium\Filters". ltd" and is located in Kirkcaldy, Fife. This item can be shipped to United Kingdom, Austria, Belgium, Bulgaria, Croatia, Cyprus, Czech republic, Denmark, Estonia, Finland, France, Germany, Greece, Hungary, Ireland, Italy, Latvia, Lithuania, Luxembourg, Malta, Netherlands, Poland, Portugal, Romania, Slovakia, Slovenia, Spain, Sweden, Australia, United States, Canada, Brazil, Japan, New Zealand, China, Israel, Hong Kong, Norway, Indonesia, Malaysia, Mexico, Singapore, South Korea, Switzerland, Taiwan, Thailand, Chile.